Citizens State Bank, Corrigan, Texas, brings this site to you. For your convenience, this site links to other community sites and third party sites. Citizens State Bank does not endorse or guarantee any of these links. The products and/or services offered on those other sites are not products or services offered by Citizens State Bank. Rates on deposit accounts listed are for information only and may change frequently. All interest rates are subject to change without notice. Please contact Citizens State Bank for our current deposit rates. E-mail messages submitted are not secure forms of communication and should not contain confidential, personal or account information. Citizens State Bank will honor your requests or concerns on the next business day. Our e-mail response to you will not include any confidential information. 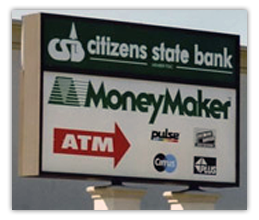 Citizens State Bank, Corrigan, Texas always offers competitive market rates. You may contact one of our friendly loan officers to answer any questions you have.